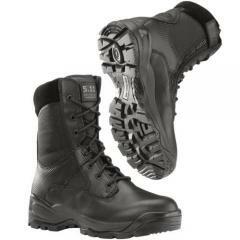 511 Tactical ATAC 8" Side Zip Boot (12001) FREE SHIPPING! The A.T.A.C. boots were designed by and for law enforcement professionals for the most comfortable work day possible. U.S.A. leather ensures a sharp appearance with a shiny polishable toe, 1200D Cordura® nylon for durability, the 511 Shock Mitigation System® technology for support, and an oil/slip resistant outsole for stability. The A.T.A.C. 8" side zip boot features a hidden side pocket, curved YKK® zipper for easy on and off capability. A.T.A.C. boots are the most comfortable high performance footwear available. All 511 Tactical boots are guaranteed against defects in workmanship and materials so you can count on the boots performing as well as you do. Haven't broke in yet, but build quality seems cheap out of the box. Not as nice as I thought they would have been. Pretty comfy will see how they fit in the next couple days. Way more comfortable than Bates boots for sure. Good boot for Canadian summers. Got a wide boot. Which was nice as a lot of companies don't offer that. These are good boots, I thought comfort level would be better though. for standing all day, my 50 Wal-Mart tactical boots held up better. The look overall is great comfort needs work. ©2002-2019 CopsPlus.com: 511 Tactical ATAC 8" Side Zip Boot (12001) FREE SHIPPING!